Prior to the introduction of power tools, a floated finish was that produced by a large, generally wooden or sometimes metal, hand float moved over the surface when the concrete was still plastic. This produced a flattish slightly textured surface which often contained float marks. Nowadays, the operation is carried out using powered machines fitted with either a large circular pan or large flat metal floats. 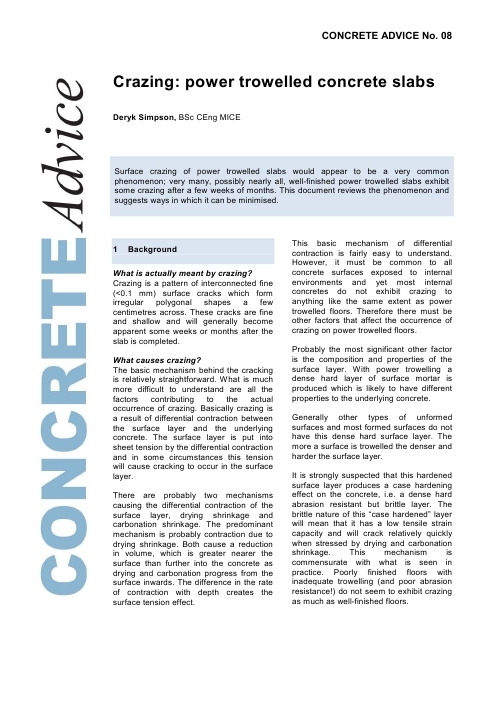 Power floating is generally carried out later than hand floating as the concrete needs to take the weight of the machine. A simple test is when the heal of a boot leaves only a slight impression, say 3mm. Power-floating produces a similar surface to hand floating, with a slightly textured surface often with circular swirl marks from the floating operation. This operation is sometimes called panning. Too many passes can cause a ´burnished´ appearance. Power floating can sometimes lead to surface delamination. 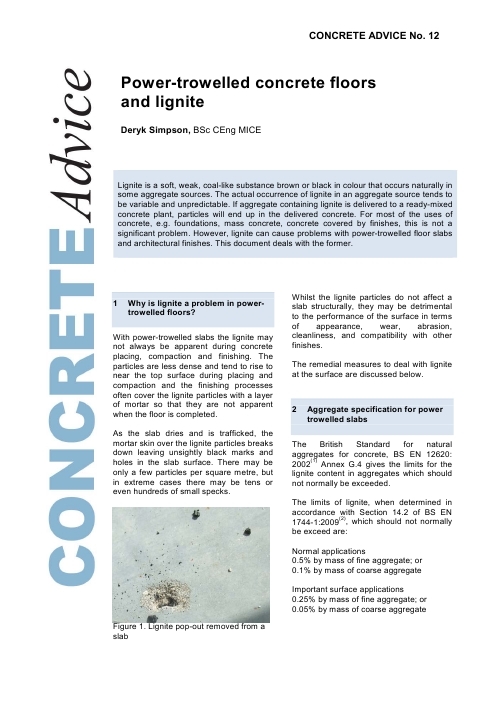 Another method of floating, namely skip floating, can be carried out on a fresh concrete surface to produce a smooth matt appearance. A large, long, narrow float on the end of a knuckled handle is pushed or pulled over the surface of the wet concrete with the leading edge always higher than the rear edge, whichever way it is moving. Skip floats are also known as easy floats or bull floats. The resultant finish tends to have a smooth texture similar to that produced by either hand or power floating, but it usually exhibits slight ridges between each pass of the float. 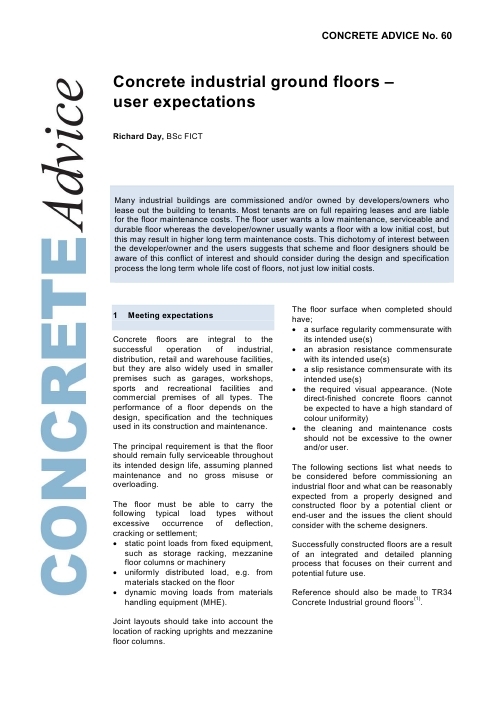 Another problem which seems to be associated with skip floating is that of reinforcement ripple when the surface of the concrete has slight depressions along the line of the top reinforcement, often giving it a quilted appearance. Care is needed in the timing of skip floating. 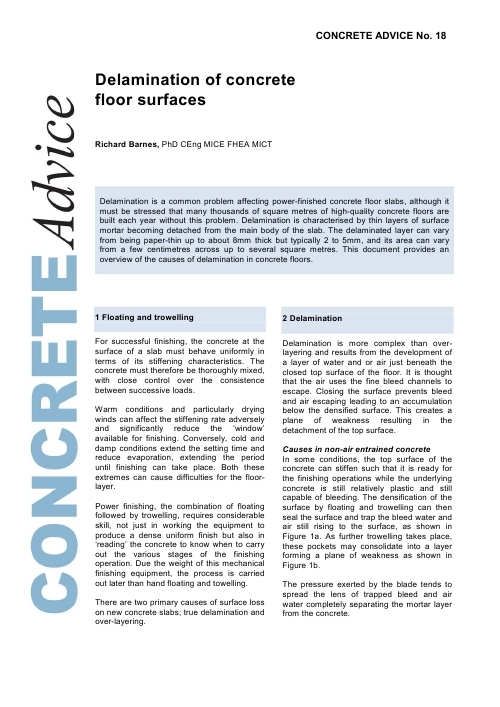 If skip floating is undertaken too early, bleed water may be worked into the surface thereby weakening it and giving a risk of rapid surface wear. A laser screeder will produce similar finish which is then power-floated and then power-trowelled. Trowelling follows floating to provide a direct finished wearing surface. When carried out correctly on concrete of the appropriate class, trowelling leaves a smooth, very dense surface. It is produced for warehouses and similar large slab areas but can also be a finish to small slabs. It is generally not appropriate for external paving. 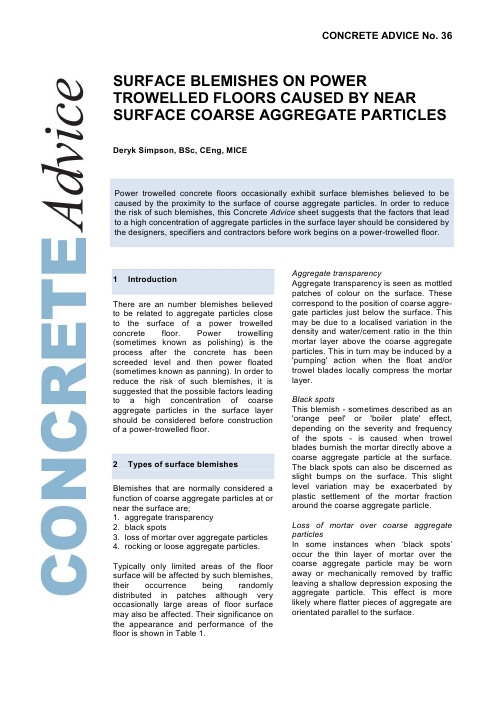 Power trowelling of air-entrained concretes is not recommended due to the risk of surface delamination. Also, trowelling before the bleed water has evaporated can lead to a risk of delamination.